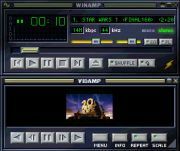 VidAmp plays AVI (DivX), QT, MPEG and ANIM videos The VidAmp plugin lets you play AVI, MPEG, MOV (QuickTime) and ANIM video clips using WinAmp. AVI and MPEG files are played using the Windows MCI drivers and MOV using Apple's QuickTime for Windows. VidAmp has native support for IFF ANIM files (types 5 and 7) - special thanks to Graham Cookman for submitting this software link to us. Please note that this is a general multimedia player for playing back AVI files. Different AVI files may be encoded with different "codecs" (compressors and decompressors ; COders and DECoders), so by having an AVI player does mean you can play every single AVI file in the world (you'll need to separately download and install the codec for the AVI file as well). For more information on codecs, AVIs, and DivX in general, please refer to our DivX Help Page.